There is a new edition to the Simplified Safety family of products: Hazard Containment. Hazard containment products from Eagle Manufacturing Company are aimed at helping employers comply with OSHA and other environmental and work safety codes. We carry the entire Eagle Manufacturing product line (download catalog), so as we load products onto our site, contact us if you cannot find what you are looking for. 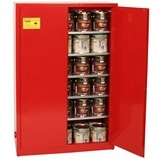 Safety cabinets are built to contain hazardous materials for several reasons. Some of those reasons include: to keep untrained employees from handling the products, to provide spill containment in the case of an accidental leak, to provide additional containment and protection in the case of fire. Storage cabinets are built to fit the products that they contain. While the construction of the different cabinets is largely similar, the different types of cabinets have different coloring, labeling, and shelving configurations to accommodate the products that will be placed inside of them. We carry cabinets for flammable liquid, paint/ink, acid/corrosive, and pesticides. EPA 40 CFR 264.175 specifies that when hazardous liquids are stored they must be stored on a containment system that is able to contain at least 10% of the volume of the containers that are placed upon it. The reason for this is simple: if a spill or leak should occur, it will be contained and not leech into the surrounding environment causing irreparable damage to the work and natural environments. Safety cans come in a variety of shapes and sizes. Their purpose: contain dangerous materials and make them easier and safer to handle. Safety cans from Eagle Manufacturing are UL listed and FM approved. The cans are tested to ensure that they 100% leak proof. Comply with OSHA 29 CFR 1910.106, 1925.152 and NFPA Code 30 by using the appropriate safety can for the liquid you are trying to contain. We are getting ramped up on our knowledge of hazard containment, but we always welcome your questions. Please consult the Eagle Manufacturing Catalogs or give us a call if you have questions.